It has been reported that vascular endothelial growth factor (VEGF) 165 and placenta growth factor (PlGF) can induce differentiation of osteoclasts via Flt-1, because Flt-1 is the common receptor of these two factors. However, little is known about osteoclast differentia-tion via Flk-1, which is one of the main receptors for VEGF165. VEGF-E showed potent stimulatory activity to endothelial cell growth vascular permeability similar to those of VEGF165 via Flk-1 but not Flt-1. The purpose of this study was to clarify whether VEGF-E can induce osteoclast and the receptors of VEGF families for osteoclast differentiation. Ten μg VEGF-E was injected into 11-day-old op/op mice and the number of osteoclasts was ob-served 3 days after the injection. The effects of both Flt-1- and Flk-1- neutralizing antibodies against the injection of VEGF165 were also observed. Finally, the expression of these recep-tors in osteoclast precursors (OCP) was examined. After VEGF-E injection into op/op mice, many osteoclasts were induced. However, the number was less than that induced by VEGF165. The number of osteoclasts induced by VEGF165 was significantly reduced by the injection of either Flt-1- or Flk-1- neutralizing antibodies. Flt-1 and Flk-1 were clearly de-tected in OCP at both the mRNA and protein levels. We concluded that VEGF-E can also induce many osteoclasts in op/op mice. Furthermore, it is suggested that the VEGF165 signal for osteoclast differentiation is mediated via both Flt-1 and Flk-1. Osteopetrotic (op/op) mice are characterized by a deficiency in osteoclasts, monocytes, and macrophages caused by the absence of functional macrophage-colony stimulating factor (M-CSF) . It has been reported that osteopetrosis in mutant mice can be cured by continuous injections of recombinant human (rh) M-CSF [2,3]. Thus, it was suggested that M-CSF is an important factor for osteoclast differentiation. Receptor activator of NF-kappaB ligands (RANKL) is expressed on the plasma membrane of osteoblasts/bone marrow stromal cells. A soluble form of opacity distribtion function (ODF) has induced osteoclast-like multinuc- leated cells in the presence of M-CSF in mouse spleen cell cultures . A TNF family molecule, osteoprotegerin ligand (osteoprotegerin ligand (OPGL); also known as TNF-related activation-induced cytokine (TRAN- CE), RANKL and ODF) was identified as a potential os- teoclast differentiation factor and mice with a disrupted OPGL gene showed severe osteopetrosis as a result of an inability of osteoblasts to support osteoclastogenesis . These results suggest that both M-CSF and OPGL are essential for osteoclast differentiation. However, it is also well known that osteoclasts in op/op mice increase progressively with age . Niida et al. demonstrated that vascular endothelial growth factor 165 (VEGF165) and placenta growth factor (PlGF) can substitute for M-CSF in osteoclast induction in the mutant mice . VEGF165 is highly specific mitogens for vascular endothelial cells [3,8]. The 165-amino acid (VEGF165), having 165 amino acids, is the major gene product found in human tissue and is the most effective angiogenic factor in the VEGF family [9,10,11]. Because osteoclasts predominantly express Flt-1 which is one of the major receptors for VEGF165 and also the only receptor for PlGF [12,13], it has been suggested that VEGF165 and PlGF may induce osteoclasts through Flt-1. On the other hand, it has been shown that osteoclasts expresses another VEGF receptor, Flk-1 as well as Flt-1, and VEGF165 can support osteo-clastic bone resorption and survival of mature osteoclasts . From these findings, we hypothesized that both Flt-1 and Flk-1 may act as receptors of VEGF165 for osteoclast differentiation. Recently, Ogawa et al. identified a gene encoding a polypeptide with an approximately 25% amino acid similarity to mammalian VEGF165 in the ge-nome of Orf virus and proposed the name VEGF-E for this protein . The purpose of this study was to clarify the receptors of VEGF families for osteoclast differentia-tion. Therefore, we investigated the effect of VEGF-E on osteoclast differentiation in op/op mice and examined the influence of Flt-1- and Flk-1-neutralizing antibodies on osteoclast induction by VEGF165 in op/op mice. Fur-thermore, we examined Flt-1 and Flk-1 expression at both the mRNA and protein levels in osteoclast precursors (OCP). B6C3Fe-a/a-op/+ male and female mice, as a breeding pair, were obtained from Jackson Laboratory (Bar Harbor, USA), and normal and op/op genotypes were raised in our laboratory. The op/op mice were identified by failure of incisor eruption at about 10 days after birth. Ten μg re-combinant human (rh) VEGF-E (Relia Tech, Braun-schweig, Germany) was injected into the peritoneal cavi-ties of 11-day-old op/op mice. Non-injected op/op mice were used as a control group (n=5 each). Three days after the injection, the mice were killed under general anesthe	sia. To investigate the effect of mouse Flt-1 and Flk-1 neutral-izing antibodies on osteoclast induction, fifteen 11-day-old op/op mice were used and divided into three groups. Group 1: 0.5 μg rhVEGF165 only (Pepro Tech, London, UK) was injected. Group 2: 50 μg Flt-1 neutralizing anti-bodies (R & D Systems, Minneapolis, USA) were in-jected at 6 hours before 0.5 μg rhVEGF165 injection and 6 hours before sacrifice (total 100 μg). Group 3: 50 μg Flk-1 neutralizing antibodies (R & D Systems, Minneapo-lis, USA) were injected at 6 hours before 0.5 μg rhVEGF165 injection and 6 hours before sacrifice (total 100 μg). Five animals were used for each group respec-tively (total 15 animals). Three days after the VEGF165 injection, the mice were killed under general anesthesia. The animals were treated under ethical regulations as de-fined by the Ethics Committee, Hiroshima University Faculty of Dentistry. Three days after the injection, the mice were killed under general anesthesia with sodium pentobarbital, fixed in 4% paraformaldehyde. The femora were removed from op/op and the specimens were decalcified in 14% EDTA (pH 7.4) for 14 days and embedded in paraffin and cut into longitudinal sections of 7 μm thickness. The five sections from each mouse were stained with tartrate-resistant acid phosphatase (TRAP), which is a generally acknowledged cytochemical characteristic of osteoclasts . Osteoclasts were identified by staining with TRAP, as multi-nucleated cells on the bone surface. Murine osteoclast precursor cells (OCP) were obtained from Cell Garage (Tokyo, Japan). The cells were cultured in α-modified MEM (Sigma, Saint Louis, USA) contain-ing 10％ FCS (Biological Industries, Kibbutz Beit-Haemek, Israel), 32 U/mL penicillin G (Meiji Seika, To-kyo, Japan), 250 μg/ml amphotericin B (Nacalai Tesque, Kyoto, Japan) and 60 μg/ml kanamycin (Meiji Seika, To-kyo, Japan) at 37℃ in a humidified atmosphere of 5％ CO₂. Total RNA was isolated from the cell cultures with a Quickprep Total RNA extraction kit (Amersham Biosci-ences, Tokyo, Japan). Single-stranded cDNA was synthe-sized from 1 μg of total RNA by use of Oligo (dT) 20primer (Toyobo, Osaka, Japan) and a Rever Tra Ace-α first strand cDNA synthesis kit (Toyobo). We used the primers for mouse Flt-1 and Flk-1 obtained from R＆D Systems (Minneapolis Inc., Minneapolis, USA). A reverse transcriptase-polymerase chain reaction (RT-PCR) was performed from 1 μl of sample cDNA and the amplification was carried out for 33 cycles (45 s at 94℃, 45 s at 54℃, 45 s at 72℃). The PCR products were analyzed by 1% agarose gel electrophoresis and visual-ized by ethidium bromide staining. Non-RT samples were used as negative controls. For immunoblot analysis, OCP were collected and washed with cold PBS. The cell pellet was lysed in a cell extraction buffer consisting of 10 mM Tris-HCl (pH 7.4), 100 mM NaCl, 1 mM EDTA, 1 mM EGTA, 1 mM NaF, 20 mM Na4P2O7, 2 mM Na3VO4, 1% Triton X-100, 10% glycerol, 0.1% SDS and 0.5% deoxycholate. The extract was centrifuged at 13000 rpm for 10 min at 4℃. The samples were electrophoresed through 7.5% acrylamide gel and the protein was transferred onto a nitrocellulose blotting membrane. The membrane was treated with 10 μg/ml of rabbit anti-Flt-1 and Flk-1 polyclonal antibodies (LAB VISION, Fremont, CA, USA). As a peroxidase-labeled secondary antibody, a goat anti-rabbit IgG (1 μg/ml) was used. Then, the membrane was stained with TMB Membrane Peroxidase Substrate (Kirkegaard & Perry Laboratories, Inc., Gaithersburg, MA, USA). Statistical significance was evaluated by analysis of vari-ance (ANOVA) and multiple-comparison test (Scheffe). A confidence level of p< 0.05 was defined as statistically significant. We performed each experiment three times for statistical analysis. First, we examined whether VEGF-E can induce osteo-clasts in op/op mice, because Flk-1 is the only specific receptor for VEGF-E. Many osteoclasts appeared in rhVEGF-E injected op/op mice, and there were lacunae of resorption by osteoclasts (Figure 1A), while only a few os-teoclasts were detected in non-injected op/op mice and the bone marrow cavity was filled with excessive bone trabe-culae (Figure 1B), The number of osteoclasts in the rh-VEGF-E injected op/op mice was significantly larger than in non-injected mice (p<0.01, Figure 2). Figure 1: Histological examination of the femora of the rhVEGF-E injection op/op mice. Figure 2: Histological examination of the femora of the rhVEGF-E injection op/op mice. After injection of 0.5 μg rhVEGF165, many osteoclasts appeared in the femora of op/op mice. 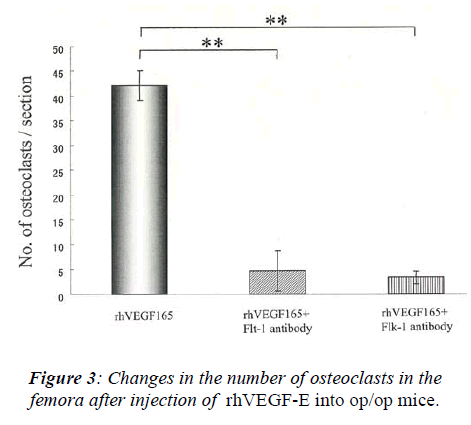 In contrast, the injection of Flt-1 or Flk-1 neutralizing antibodies signifi-cantly suppressed the increase of osteoclast number in-duced by rhVEGF165 (Figure 3, p<0.01). No significant difference was found between the injection of Flt-1 and Flk-1 antibodies. 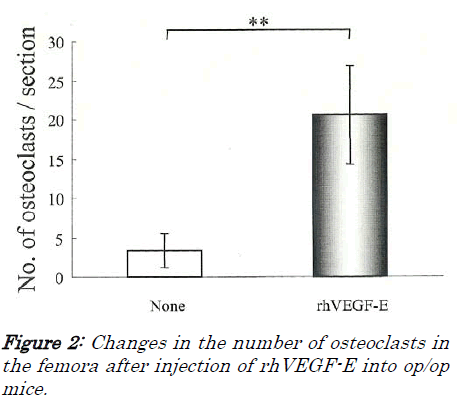 Figure 3: Changes in the number of osteoclasts in the femora after injection of rhVEGF-E into op/op mice. We hypothesized that OCP possess both Flt-1 and Flk-1, and that osteoclast differentiation is mediated via these receptors. Therefore, to determine the expression of VEGF165 receptors at the mRNA level, RT-PCRs for Flt-1 and Flk-1were performed. The cDNAs for Flt-1 and Flk-1 were amplified at a position corresponding to 569 bp for Flt-1 and 302 bp for Flk-1 products (Figure 4A). No PCR product was detected for negative controls (Figure 4A). We also confirmed the expression of the two receptors at the protein level by Western blot analysis. With the anti-Flt-1 antibody, we found an immunoreactive protein band of 180 kDa corresponding to Flt-1. A band of 180 kDa corresponding to Flk-1 protein was also detected with anti-Flk-1 antibody (Figure 4B). 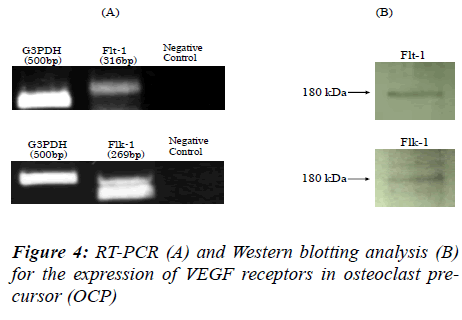 Figure 4: RT-PCR (A) and Western blotting analysis (B) for the expression of VEGF receptors in osteoclast pre-cursor (OCP). Osteopetrosis in op/op mice is caused by a severe defi-ciency of osteoclasts as a result of the absence of func-tional M-CSF. The mutant mice have a 1-bp insertion within the coding region of the M-CSF gene on chromo-some 3 . Previous studies demonstrated that injection of rhM-CSF can induce osteoclast differentiation and cure the disease [2,9]. Kodama et al. established a clonal stro-mal cell line OP6L7 capable of supporting hemopoiesis from newborn op/op mouse calvaria, and showed that TRAP-positive cells appeared only when bone marrow cells were cultured in contact with OP6L7 cells and rhM-CSF . a TNF family molecule, osteoprotegerin ligand (OPGL; also known as TRANCE, RANKL and ODF) was identified as a potential osteoclast differentiation factor and mice with a disrupted OPGL gene showed severe os-teopetrosis as a result of an inability of osteoblasts to sup-port osteoclastogenesis  . However, it is well accepted that op/op mice show an increase in osteoclast activity with aging, indicating that op/op mice demonstrate an age-related resolution of osteopetrosis . This finding suggests that some alternative factor may substitute for M-CSF in osteoclast differentiation. Niida et al. showed that a single injection of rhVEGF165 and rhPlGF can induce osteoclast recruitment in op/op mice. Most of the osteoclasts induced gradually with age in op/op mice disappeared after injections of anti-VEGF165 antibody, suggesting that endogenous VEGF165 may cause osteo-clast differentiation in aged op/op mice . Since Flt-1 is a common receptor for VEGF165 and PlGF, and both factors showed monocyte activation and chemotaxis me-diated via Flt-1 [17,18], it is reasonable to suspect that VEGF165 induces osteoclasts via Flt-1. On the other hand, Nakagawa et al. found that VEGF165 stimulated the bone-resorbing activity of isolated mature osteoclasts by enhancing their survival . Mature osteoclasts ex-pressed Flt-1 and Flk-1 at the mRNA and protein levels, indicating that the stimulatory effect of VEGF165 might be mediated through either receptor, or through both of them . However, there was no information available as to which receptor could act individually, especially during osteoclast differentiation. A previous study showed that VEGF-E demonstrated mi-totic activity on primary endothelial cells and vascular permeability activity at the same levels to those of VEGF165 . Since VEGF-E bound Flk-1 but not Flt-1, it was thought that these activities were mediated only through Flk-1 [15,19]. Our present study clearly showed that a single injection of VEGF-E can induce osteoclast recruitment in op/op mice, suggesting that the VEGF-E signal is mediated through Flk-1. Taken together with the previous report that PlGF can also induce many osteo-clasts in op/op mice , it is suggested that VEGF family may induce osteoclasts via both Flt-1 and Flk-1.Our result showed that around 20 osteoclasts appeared on op/op mice by VEGF-E injection. Niida et al. reported that around 40 osteoclasts were observed in op/op mice by VEGF165 and PlGF injection. From these findings, it is suggested that VEGF-E has almost same effect for osteo-clast induction compared with VEGF165 and PlGF. Next, we examined the effect of neutralizing antibodies for Flt-1 and Flk-1 on osteoclast differentiation in op/op mice. Flt-1 or Flk-1 neutralizing antibodies significantly reduced the number of osteoclasts induced by rhVEGF165. Furthermore, we found that osteoclast pre-cursor (OCP) expressed Flt-1 and Flk-1 at the mRNA and protein levels. These findings confirmed our suggestion that Flt-1 and Flk-1 act as receptors for VEGF family dur-ing osteoclast differentiation. VEGF165, known as a vascular permeability factor , is a potent and specific mitogen for vascular endothelial cells and promotes neovascularization [21,22,23]. It is also well known that angiogenesis is necessary for bone remodeling. Recently, it was reported that cyclic tensile forces enhance the expression of VEGF165 in osteoblas-tic MC3T3-E1 cells, suggesting that osteogenic cells (such as osteoblasts) and angiogenesis are closely related to each other . Moreover, Kodama et al. showed that estrogen deficiency after ovariectomy could induce osteo-clast formation in op/op mice. The upregulation of the number of osteoclasts was inhibited by VEGF165-neutralizing antibodies . From these findings, it is thought that VEGF165 may act as both an angiogenetic and a bone remodeling factor in several biological condi-tions mediated through Flt-1 and Flk-1. This study was funded by a Grant-in-Aid (No. 14771179) from the Ministry of Education, Science, Sports and Cul-ture of Japan. Senger DR, Galli SJ, Dvorak AM, Perruzzi CA, Harvey VS, Dvorak HF. Tumor cells secrete a vascular perme-ability factor that promotes accumulation of ascites fluid. Science 1983; 219: 983-985. Begg SK, Radley JM, Pollard JW, Chisholm OT, Stanley ER, Bertoncello I. Delayed hematopoietic development in osteopetrotic (op/op) mice. J Exp Med 1993; 177: 237-242. Ferrara N, Carver-Moore K, Chen H, Dowd M, Lu L, O?Shea KS, Powell-Braxton L, Hillan KJ, Moore MW. Heterozygous embryonic lethality induced by targeted inactivation of the VEGF gene. Nature 1996; 380: 439- 442. Mallet C, Feraud O, Ouengue-Mbele G, Gaillard I, Sap-pay N, Vittet D, Vilgrain I. Differential expression of VEGF receptors in adrenal atrophy induced by dexa-methasone: a protective role of ACTH. Am J Physiol Endocrinol Metab 2003; 284: E156-E167. Kodama H,Yamasaki A, Nose M, Niida S, Ohgame Y, Abe M, Kumegawa M, Suda T. Congenital osteoclast deficiency in osteopetrotic (op/op) mice is cured by in-jections of macrophage colony-stimulating factor. J Exp Med 1991; 173: 269-272. Clauss M, Weich H, Breier G, Knies U, Rockl W, Wal-tenberger J, Risau W. The vascular endothlial growth factor receptor flt-1 mediates biological activities: implication for a functional role of placenta growth factor in monocyte activation and chemotaxis. J Bio Chem 1996; 271: 17629-17634. Nakagawa M, Kaneda T, Arakawa T, Morita S, Sato T, Yomada T, Hanada K, Kumegawa M, Hakeda Y. Vascu-lar endothelial growth factor (VEGF) directly enhances osteoclastic bone resorption and survival of mature osteoclasts. FEBS Lett 2000; 473: 161-164. Fernandez M, Vizzutti F, Garcia-Pagan JC, Rodes J, Bosch J. Anti-VEGF receptor-2 monoclonal antibody prevents portalsystemic collateral vessel formation in portal hypertensive mice. Gastroenterology 2004; 126:886- 894. Hammarstrom LE, Hanker JS, Toverud SU.Cellular dif-ferences in acid phosphataseisoenzymes in bone and teeth. Clin Orthop Rel Res 1971; 78: 151-167. Leung DW, Cachianes G, Kuang WJ, Goeddel DV, Ferrara N. Vascular endothelial growth factor is a se-creted angiogenic mitogen. Science 1989; 246: 1306-1309. Belotti D, Paganoni P, Manenti L, Garofalo A, Marchini S, Taraboletti G, Giavazzi R. Matrix metalloproteinases (MMP9 and MMP2) induce the release of vascular en-dothelial growth factor (VEGF) by ovarian carcinoma cells: implications for ascites formation. Cancer Res 2003; 63: 5224-5229. Ogawa S, Oku A, Sawano A, Yamaguchi S, Yazaki Y, Shibuya M. A Novel Type of Vascular Endothelial Growth Factor, VEGF-E (NZ-7 VEGF), Preferentially Utilizes KDR/Flk-1 Receptor and Carries a Potent Mi-totic Activity without Heparin-binding Domain. J Biol Chem 1998;273: 31273-31282. Park JE, Chen HH, Winer J, Houck KA and Ferrara N. Placenta growth-factor. Potentiation of vascular endo-thelial growth-factor bioactivity, in vitro and in vivo, and high affinity binding to Flt-1 but not to Flk-1/KDR. J Biol Chem1994; 169: 25646-25654. Motokawa M, Kaku M, Tohma Y, Kawata T, Fujita T, Kohno S, Tsutsui K, Ohtani J, Tenjo K, Shigekawa M, Kamata H, Tanne K. Effects of cyclic tensile forces on the expression of vascular endothelial growth factor (VEGF) and macrophage-colony-stimulating factor (M- CSF) in murine osteoblastic MC3T3-E1 cells. J Dent Res 2005; 84: 422-427. Niida S, Kaku M, Amano H, Yoshida H, Kataoka H, Nishikawa S, Tanne K, Maeda N, Nishikawa S, Kodama H. Vascular endothelial growth factor can substitute for macrophage colony-stimulating factor in the support of osteoclastic bone resorption. J Exp Med 1999; 190: 293- 298. Ferrara N, Henzel WJ. Pituitary follicular cells secrete a novel heparin-binding growth factor specific for vascu-lar endothelial cells. Biochem Biophys Res Commun 1989; 161: 851-858. Yoshida H, Hayashi S, Kunisada T, Ogawa M, Nishi kawa S, Okumura H, Sudo T, Shultz LD, Nishikawa SI. The murine mutation osteopetrosis is in the coding region of the macrophage colony stimulating factor gene. Nature 1990; 345: 442-444. Barleon B, Sozzani S, Zhou D, Weich HA, Mantovani A, Marme D. Migration of human monocytes in response to vascular endothelial growht factor (VEGF) is media-ted via the VEGF receptor flt-1. Blood 1996; 87: 3336-3343. Matsuzaki K, Udagawa N, Takahashi N, Yamaguchi K, Yasuda H, Shima N, Morinaga T, Toyama Y, Yabe Y, Higashio K, Suda T. Osteoclast differentiation factor (ODF) induces osteoclast-like cell formation in human peripheral blood mononuclear cell cultures. Biochem Biophys Res Commun 1991; 246: 199-204. Sawano A, Takahashi T, Yamaguchi S, Aonuma M, Shibuya M. Flt-1 but not KDR/Flk-1 tyrosine kinase is a receptor for placenta growth factor, which is related to vascular endothelial growth factor. Cell Growth Differ 1996; 7: 213-221. Kodama H, Nose M, Niida S and Yamasaki A. Essential role of macrophage colony-stimulating factor in the osteoclast differentiation supported by stromal cells. J Exp Med 1991; 173: 1291-1294. Carmeliet P. Angiogenesis in health and disease. Nat Med 2003; 9: 653-660. Kodama I, Niida S, Sanada M, Yoshiko Y, Tsuda M, Maeda N, Ohama K. Estrogen regulates the production of VEGF for osteoclast formation and activity in op/op mice. J Bone Miner Res 2004; 19: 200206. Meyer M, Clauss M, Lepple-Wienhues A, Waltenberger J, Augustin HG, Ziche M, Lanz C, Buttner M, Rziha HJ, Dehio C. A novel vascular endothelial growth factor encoded by Orf virus, VEGF-E, mediates angiogenesis via signalling through VEGFR-2 (KDR) but not VEGFR-1 (Flt-1) receptor tyrosine kinases. EMBOJ 1999; 18: 363-374. Gospodarowicz D, Abraham JA, Schilling J. Isolation and characterization of a vascular endothelial mitogen produced by pituitary-derived folliculo stellate cells. Proc Natl Acad Sci U. S. A. 1989; 86: 7311-7315.